When Apple presented iBooks on the iPad on January 27, 2010, I was very excited to see that they had adopted the standard EPUB format. But I especially wanted to know how they had created the beautiful EPUB format of Winnie the Pooh, and how they made it look so lovely on that gorgeous iPad. 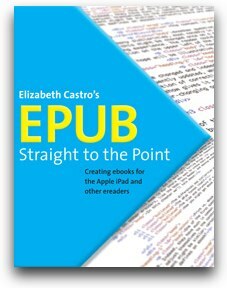 I decided to write a book on how to create EPUB format ebooks. My book about creating ebooks in EPUB format has garnered rave reviews. EPUB Straight to the Point: Creating ebooks for the Apple iPad and other ereaders was published by Peachpit Press and myself in both print and electronic editions. EPUB Straight to the Point explains how to create ebooks in the standard EPUB format, starting with tools you may already be familiar with: Microsoft Word and Adobe InDesign, and how to use either one (not to mention the documents you may already have in those formats) to generate the files necessary for creating an EPUB format ebook. 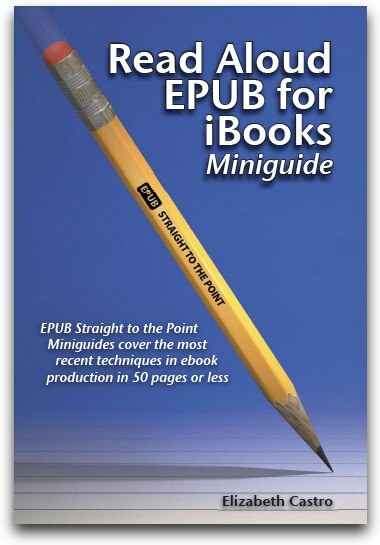 But because neither of those programs creates a fully valid EPUB file, the book also takes a closer look at the inner workings of an EPUB format file, and shows you how to use a text editor to complete the EPUB file, including the creation of a cover and navigational table of contents. In the last chapter, the book explains how to take full advantage of the formatting strengths of EPUB, while taking into account the quirks of the iBooks ereader app on the iPad. You'll learn how to specify fonts and text-alignment, wrap text around images, add drop caps to the beginning of a paragraph, format short lines like poetry, and much more. You can order printed copies of the book from Amazon, Barnes & Noble, or Peachpit Press. You can buy the EPUB and PDF formats of the book right here, right now! (or by clicking the Buy Now link in the left navigation). And, of course, follow the navigation links at left to see an excerpt, the table of contents, or the index. 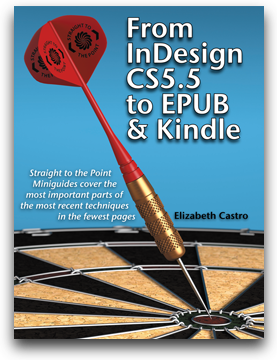 From InDesign CS 5.5 to EPUB and Kindle, published December 12, 2011 is a 76 page book, available in both electronic and print formats, about how to take advantage of the improvements in EPUB export made to InDesign CS 5.5, including creating a cover, mapping styles to tags, adding audio and video, and more. It is available in print from Amazon, Barnes & Noble, and other resellers, and in electronic formats (EPUB, Kindle/mobi, and PDF) from me. 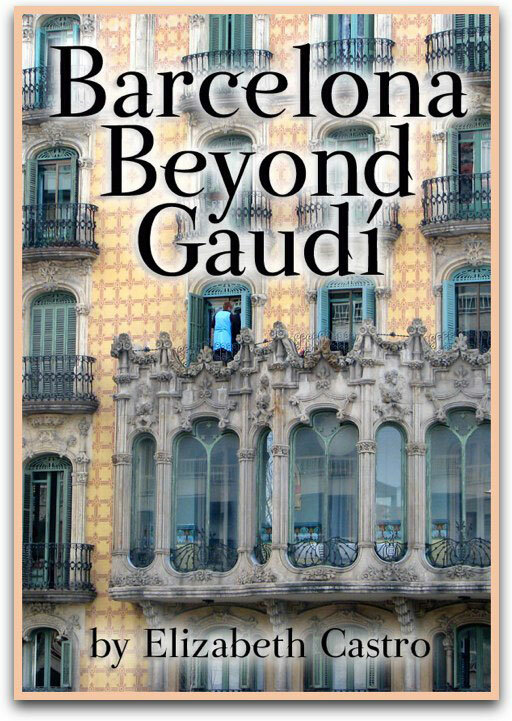 You can also find the Kindle format on Amazon, and the EPUB format on the Apple iBookstore (in all 32 countries). There are many interesting uses for Read Aloud books, including picture books that kids can have read to themselves—perhaps while they're learning to read, language training books with audio spoken as the foreign words are highlighted, photography portfolios with background soundtracks, and even plays that could be published with included dramatic readings. In my Read Aloud EPUB for iBooks, I explain how to record and mark an audio track, mark the words in the text (with GREP) so that they can be highlighted when the audio is played, and associate the files in a format that iBooks recognizes. I also show how to create start and stop buttons and add a background soundtrack. Read Aloud EPUB for iBooks is 48 pages long, and comes in digital (EPUB and PDF versions) as well as full-color print editions, both of which contain an example file that you can unzip and study. 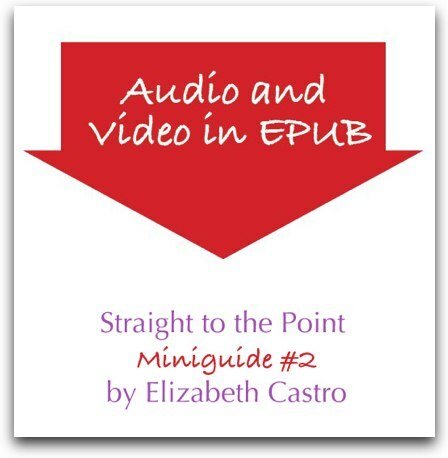 If you're interested in adding audio and video to your EPUB files, Audio and Video in EPUB: Straight to the Point will tell you pretty much everything you need to know. Published in May, 2011, it includes information about how to choose and set the aspect ratio, format, and size, and then how to embed these multimedia files into EPUB format ebooks that look beautiful and play properly in iPad, iPhone, iPod touch, and also in Barnes & Noble's new NOOK Color. This 29 page “miniguide” costs $5, is available in EPUB and PDF formats, includes example files, and can only be purchased directly from my site. The booklet is not a replacement or update to EPUB Straight to the Point, but a sort of mini-sequel to it. 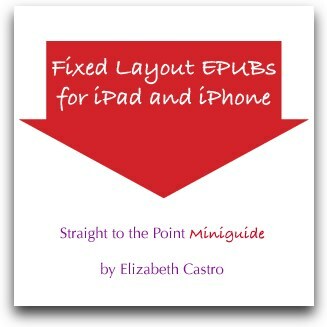 In February, 2011, I wrote the first Straight to the Point Miniguide: Fixed Layout EPUBs for iPad and iPhone. It is a 20-page booklet that focuses on formatting illustrated, fixed layout books supported by iBooks 1.2+ which was released in December, 2010.